latter’s official visit to France. in French as part of the South African DSTV package. English), as well as in the country’s second city, Kitwe (in French, English and Swahili). This is a joke. The whole president lungu went to France to pick up a France 24 decoder.?? Because this all it is. 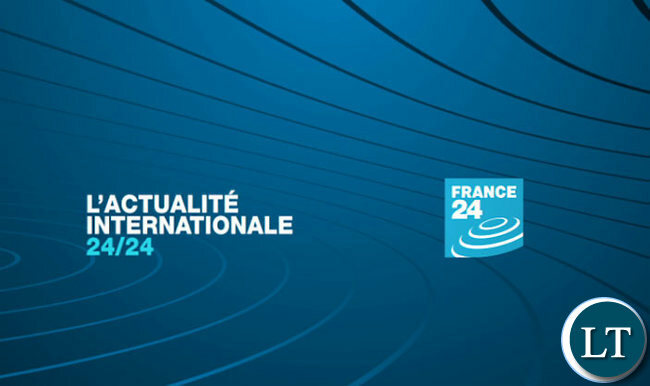 France 24 is a free to air channel, meaning anyone can get it with a right decoder costing less than $200. All ZNBC have to do is take the output of that decoder and add it to thier mux for retransmission. PF have run out of things for lungu to sign to make him look like he is working. What a shame. Ba patrick Ubukopo ebututu bwine. If you do illegal things doesn’t mean everyone should do them. As far as we know and what the article says, znbc DG signed for this pact. And ecl has opened up a lot of deals while on France besides France 24. Read what is “free to air channel” and you might get a sense of what the whole president is getting credit for. PF VESSEL: dockingstation, dockingstation this is an emergency, the PF VESSEL has only 1 gear in reverse while we needed 5 in reverse and only one forward. The policy statements issued that we need to reverse are comming fast. Yaba @Patrick imagine, and someone will say this is good. At least if the brains behind France 24 gave ideas to ZNBC on how to make ZNBC more appealing to the audience now our tax has to cater for a foreign channel too. 2016 IVOTI NI PALI EDGAR CHAGWA LUNGU- PF. @1 PATRICK YOU ARE VERY SHORT-SIGHTED. PROBABLY, YOU ARE NOT EVEN SIGHTED. THE MAIN ISSUE HERE IS TECHNOLOGY TRANSFER AND STANDARDS IN THE MEDIA INDUSTRY FOR WHICH ZAMBIA IS VERY FAR. THE IDEA THAT THEY WILL EVEN BE BROADCASTING IN SWAHILI TRANSLATES INTO TANZANIA, BURUNDI, RWANDA AND CONGO TUNING LISTEN/WATCHING TO ZAMBIA. AND SINCE ZAMBIA IS HEADED FOR SERIOUS FARMING, MANUFACTURING, FOOD PROCESSING AND TOURISM- WITH MODERN TECHNOLOGY INTRODUCED IN ZNBC MARKETING OF PRODUCTS AND SERVICES WILL BE VERY EFFECTIVE TO ALL THESE SURROUNDING COUNTRIES WHILE AT THE SAME TIME THE FRENCH ESTABLISHING THEIR PRESENCE IN THE SOUTHERN AFRICAN REGION. THE FRENCH ARE PRO-ACTIVE AND CLEVER. I also enjoy pipe dreams like you,,,, but not in upper case letters! Enjoy your dreams in your restrictive web mr webman, but what Peter has said makes a lot of sense. You are missing the point. There is nothing wrong with France 24 being in Zambia, but instead of the whole presidency taking credit for picking up a decoder in France, ZAMTEL customers have had no Internet access for 6 days with reports of disgruntled staff and lungu could have looked better attempting to take credit for more important issues then picking up a decoder. Obnoxious snobbish French trying to gain audience in a losing battle with dozens of English Language channels. Truly laughable. ..24 hours for a TV licence to awarded because the dull President says so and you wonder why our institutions are weak…50 years after independence and you still allowing yourselves to be brainwashed. If an individual would have waited for 12 months to get this licence awarded. Comment:why is it that some people will try and not see positivity in anything that the current government will do.criticise all he does but the truth will be known when your choice will weep again.some of you re far from the reality on the ground,those that re in constant touch with the people in public places on the copperbelt will tell you we with lungu,just wait and see.